← Want to reduce weather hype, weather blame? Then build weather resilience. WxGeeks. A serious voice in a vital national conversation. WxGeeks. The name for this weekly offering of The Weather Channel has a lighthearted, slangy feel, but don’t be fooled. The conversation is pure gravitas. To see this, it helps to review a little history. Time was, more than half a century ago, the country had only three national television networks instead of several hundred. Back then, every Sunday morning, the country and the television industry would shift attention from entertainment to serious matters. The same families that huddled around the set during the week to watch I Love Lucy or Howdy Doody or Leave it to Beaver or Friday night boxing would tune in early Sunday morning for religious programming. Then, immediately following, they’d watch CBS’ Face the Nation or NBC’s Meet the Press, or ABC’s Issues and Answers. There the American public would find moderators and small panels of reporters interviewing prominent figures from the world of politics or business on important issues and events of the day. The shows weren’t slanted toward a conservative or liberal bias; instead they were middle-of-the-road. By virtue of their selection of topics, guests, and conversational, unscripted formats, they built public awareness of challenges and opportunities facing the United States. At the same time, and this was largely an unintended consequence, they contributed to building consensus on how to move forward, and at an even deeper level, forged American values. Today, all that has changed. Cable and the internet now bring hundreds of channels into every home. This technical revolution has fragmented U.S. viewership, and fostered niche markets playing to diverse audiences and a wide range of particular views. The social implications are proving profound. The experience to date suggests the richer variety of today’s offerings is dividing us into multiple communities as much as it is building any unity. However, the benefits to airing and celebrating America’s full diversity are incalculable. One such benefit? Against the backdrop of these powerful social and technological trends, The Weather Channel appears to be breaking new ground with its new Sunday noontime talk show, WxGeeks. All of us would do well to pay attention to what’s unfolding. At the start, WxGeeks (perhaps in an attempt to lower expectations) seemed to promise a show primarily for weather professionals and weather aficionados. It looked to focus on the backstory behind the advance of meteorological science (writ broadly: encompassing climatology, oceanography, space weather, hydrology, environmental issues, and much more), and the development of forecasts, warnings, and other services. As such, it’s been a welcome addition to the network’s fuller complement of forecasts and stories based on the experience of weather, particularly in extreme events. But in more recent weeks, it seems the show’s ambitions and reach have grown. Increasingly it’s tackling the connection between Earth observations, science, and services, and national and even global concerns. In so doing, it’s carving out a unique space. By treating issues that matter to the entire American public, WxGeeks is putting itself on the same level as those legacy Sunday morning programs on the broadcast networks. But it’s focusing on a single but major slice of that national agenda – water and atmospheric resources, and their link to food and energy production; hazards and their threat to public safety, business continuity, and even national security; and environmental protection. The guests on the program are of truly national, even international standing: The President’s science advisor, John Holdren. The eminent British primatologist, ethologist, and anthropologist Jane Goodall. Former astronaut and current NOAA Administrator Kathy Sullivan. Former Oceanographer of the Navy, Admiral David Titley (Ret.). Consider the February 1 program, for example. It brought together FEMA Administrator Craig Fugate, NOAA NWS Director Louis Uccellini, and NBC/NYC Channel 4 Chief Meteorologist Janice Huff to discuss the forecasts and emergency response to last week’s nor’easter that paralyzed Boston and Long Island, but spared (relatively speaking) the heart of New York City. The discussion provided a nice tutorial of the difficulties in making hazardous weather forecasts, the need to mobilize emergency response based on forecasts, rather than waiting for snow on the ground, and the role of the private sector in communicating such risks to the public. The conversation was refreshingly thoughtful, nuanced. The policies the United States adopts with respect to challenges such as these, the investments we make in what NOAA Administrator Sullivan refers to as environmental intelligence, and our stance in sharing what we learn and know in with other nations, will shape our place in the world throughout the remainder of the century. If The Weather Channel can keep a high-level focus on issues that matter, and continue to bring in guests of comparable stature and quality over the coming months – then the network will bring much-needed national attention to these subjects. If this can be sustained not just for months, but for years, then it will transform America’s prospects every bit as much as, say, President Theodore Roosevelt did when he instituted our system of National Parks. 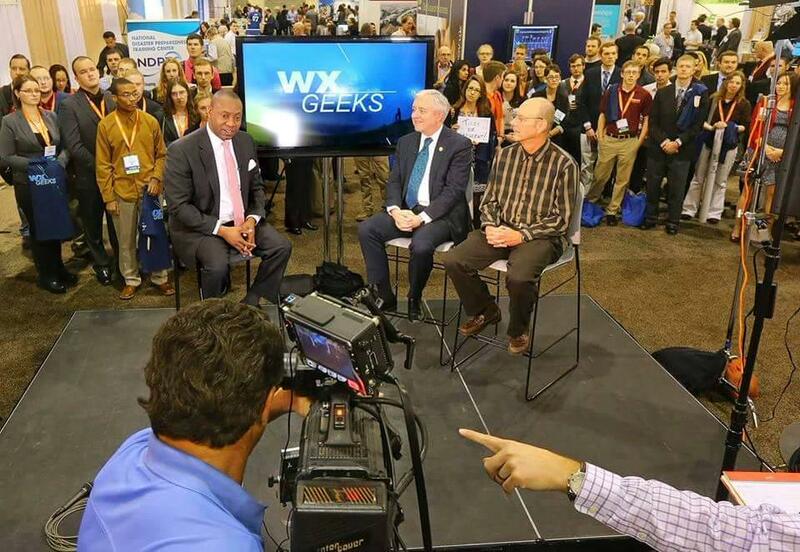 A closing reflection: through a mix of luck and brilliant insight, The Weather Channel hit on Marshall Shepherd as the host for WxGeeks. A first-rate researcher, gifted communicator, who asks thoughtful questions rather than baiting his guests, Dr. Shepherd has already been compared with Neil deGrasse Tyson; soon he may be compared with the likes of Bob Schieffer or Tim Russert. To all involved, keep it up! Please. Something similar of course was available from PBS during the same era.